My Lai. If you know anything at all about the war in Vietnam, you know this word. It was the village where more than 100 unarmed civilians were killed by American soldiers during a 1968 offensive. The word has taken on literal and symbolic meaning. 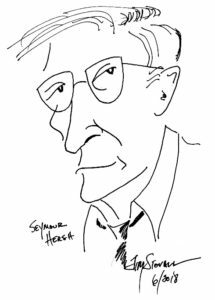 We might not know the word at all if it had not been for the efforts of a remarkable, single-minded reporter named Seymour Hersh. The My Lai massacre story was one of many major scoops that Hersh broke in his remarkable career. Now he has written a memoir, Reporter: A Memoir by Seymour Hersh, and the quote above is from a review in The Guardian by Rachel Cooke. Hersh has done what reporters are supposed to do: he has found things out that people — often powerful people have wanted to keep hidden — and he has reported those things. He has not always been right, and he has rarely been gentle. But as a matter of personal and symbolic pride, he has never been invited to the White House for dinner.